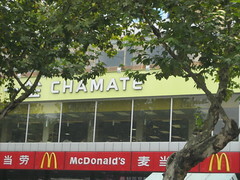 I wrote about Chatea, a Chinese fast food company a while ago. I have been there inÂ myÂ China trip last year. Apparently they are expandingÂ all these years andÂ they just announced a new round of funding. GGV (together withÂ IDGVC, SIG, Neil Shen, TECO and FMCG) investedÂ $10.68 m for 20% stake. Note Neil Shen (co-founder of Ctrip and Home Inns) is on the list again. As suggested in the article, once the estimated marketÂ capitalÂ reaches $100 m, they will goÂ for IPO (most likely 2008). So stay tuned. This is anotherÂ good play for “emergence of Chinese middleÂ class consumers”. A very attractive name and seems it is a good sign that it is expanding internationally.